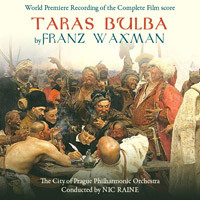 After the great success of the new recordings of CONAN THE BARBARIAN and LAWRENCE OF ARABIA, the next project for Tadlow Music Records is the complete score from the 1962 Epic TARAS BULBA starring Yul Brynner and Tony Curtis. Not the greatest of movies but certainly one of the finest of all scores composed by Franz Waxman. Initial sessions were held in November with the City of Prague Philharmonic Orchestra conducted Nic Raine at in November…with final sessions schedule for January with the composer’s son, John Waxman in attendance.